Pets ingratiate themselves into your life in funny ways. About fourteen years ago, an 11-year old Elizabeth Case and I trekked to Sacramento to look at some Corgi pups. The breeder brought out the Corgi’s, who looked pretty bland and sort of lay there looking at us. Neither my daughter nor I were particularly impressed. After several minutes, a tiny double-dapple shorthair miniature dachshund pup trotted out, hopped into Elizabeth’s lap and into our lives. We named her Jania. We later decided Jania needed a companion. Unlike our first dog hunt, we looked specifically for dachshunds. I knew relatively little about the breed other than the usual stereotypes. I know I wanted another miniature, however. One of our neighbors owned a full-size dachshund named Oscar (yeah, I get the joke), and Oscar was massively fat. We’d gotten used to tiny Jania, who never weighed more than 12 pounds dripping wet. What we found was Sophie. 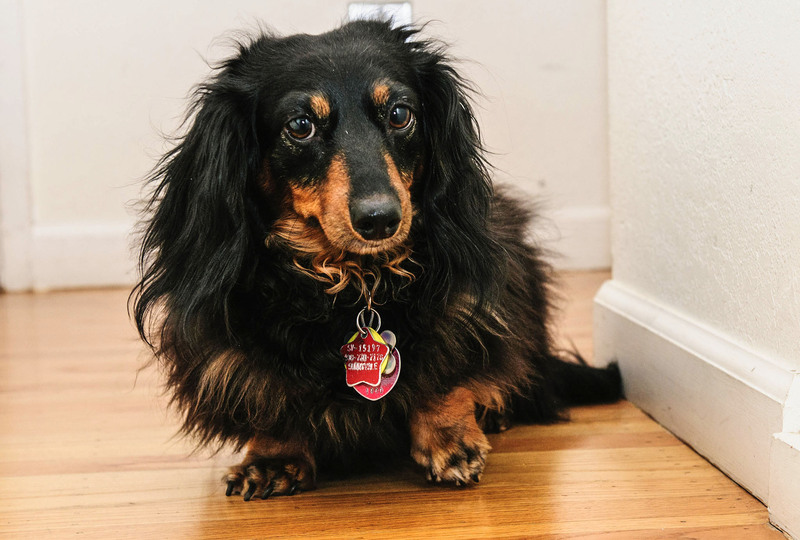 Sophie was neither miniature nor full-size — a “tweenie” as they’re often called. At her heaviest, Sophie weighed about 14.5 pounds. Sophie was also a longhair dachshund which I was completely unfamiliar with until I found her. I also later learned that she probably came from a puppy mill, another source of ignorance on my part. Even so, Sophie was a sweetheart, constantly wanting attention but also giving it right back. Sophie eventually became my wife Jan’s constant companion. In theory, small dogs live longer than big dogs, but that wouldn’t be the case with either Jania or Sophie. Jania was almost wilfull about hastening her demise. At a little over a year old, she gnawed through a hard plastic ibuprofen bottle and ate about a hundred pills. Too small for stomach pumping, the emergency vet had to induce vomiting. Roughly two days and $1,000 later, Jania was back home. Over the years, she tried to eat snail bait and several other toxic substances. As far as she was concerned, if it looked like food, it was food. Sophie had different issues. 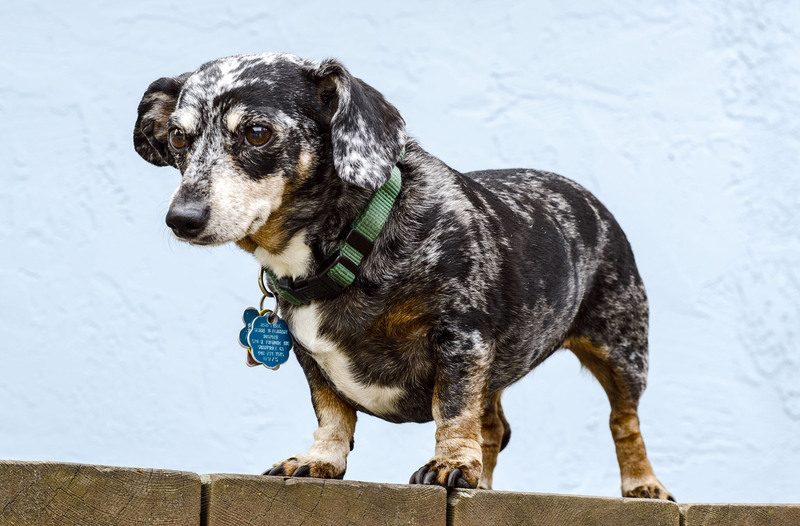 At about six years old, she suffered from spinal problems that plague one in five dachshunds. She had to have back surgery to prevent her hind legs being permanently paralyzed. But at age 12, she contracted liver cancer. She passed away with great dignity for such a little dog. Just three months later, Jania’s internal systems started failing, probably due as much to her attempts to poison herself over the years as age and soon joined Sophie wherever dogs go when they die. And it hurt. I never thought losing a pet would hurt, but to lose two within a few months felt unusually cruel. A few months later, the hurt passed. My younger daughter headed off to graduate school and Jan and I were now officially empty-nesters. We started thinking once again about dogs. This time, though, we looked at rescue dogs. In northern California, the vast majority of rescue dogs seemed to be some variant of either pit bulls or chihuahuas. I’m sure that was merely misperception on my part, but I sure saw a lot of different variants and mixes of those breeds. Neither seemed appealing to me, probably because I still thought about the dachshunds who so recently shared our homes. I looked at purebred puppies, but in the end, didn’t want to spend a cool grand or more on a puppy I’d need to train from scratch. Then I stumbled across a listing on Kate’s Rescue, a northern California-based pet rescue group. Barkley looked much like a longhair dachshund at first blush. So I filed an application for adoption and Jan and I drove up to take a look at Barkley. We found Barkley at an adoption event at a pet store, noisily barking at everyone. But after a few minutes, Barkley warmed up to Jan, who in turned fell for his charm. 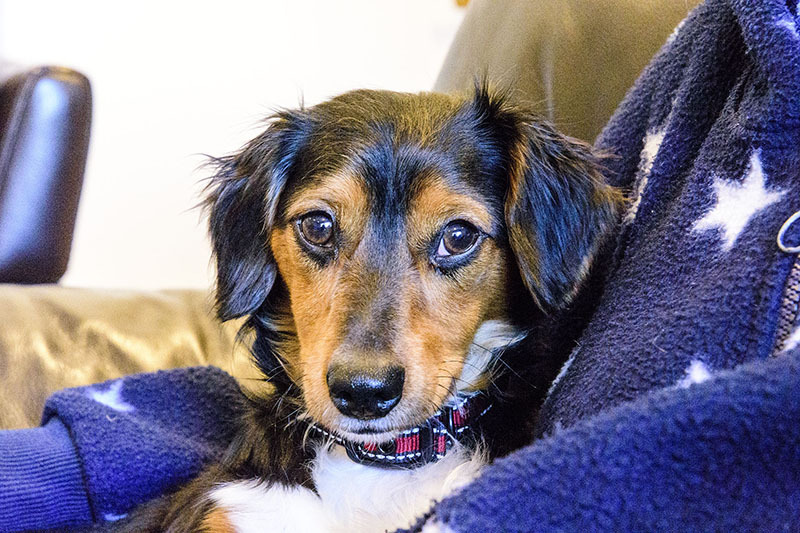 Barkley’s foster owner, Jade, helped us with the contract and now we have a new resident. Barkley almost certainly isn’t a purebreed dachs. 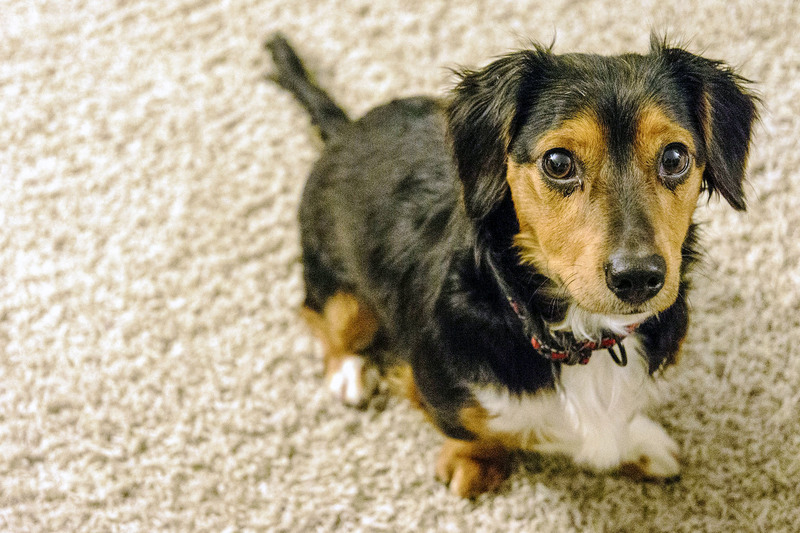 Apparently left at a pet shelter by his former owners, the medical form from the shelter listed his breed as “dachshund lh mix” — lh likely standing for longhair. His legs are just a little long for a dachshund, and his coloring is a bit different. I’m guessing he may have a little beagle in him — he can certainly jump like a beagle — but that’s only a guess. 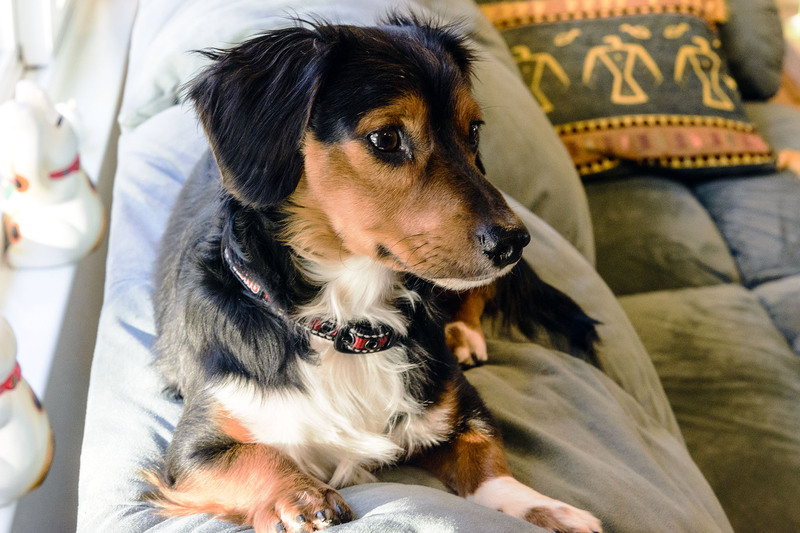 He’s mostly dachshund, though much quieter than our previous dogs. Our best guess as to his age, based on his medical records, is that he’s about sixteen months old as I write this, which suggests he was born around June 2015. Like most miniature dachshunds, Barkley likes to climb up to the highest perch he can reach. In our house, that’s the back of the couch next to the window. I’ll sometimes walk into the room and see him perched there, and momentarily think that Sophie’s somehow back. So the Case house has a new dog, not quite the same as the old dogs. His personality is quite different. For one thing, he’s much more comfortable around other dogs than our previous dachshunds but less trusting around people he meets for the first time. He’s much quieter in general, though. Even when perched on the couch looking out the window, he rarely barks. He didn’t bark at all when he chased a squirrel up a tree nor when we startled a cat out of hiding behind a bush. Despite being with us only a few days, he’s clearly decided Jan and I are part of the pack. We can only hope he considers us the alphas.